Home > Commercial-Land Mobile-Marine > BP-186h : 7.2 volt 2000mAh ENELOOP Ni-MH battery for ICOM IC-M1 marine radios. 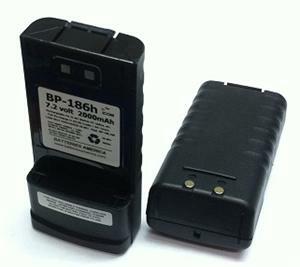 BP-186h : 7.2 volt 2000mah ENELOOP rechargeable LONG LIFE Ni-MH battery for ICOM IC-M1 marine HT radios. NEW & IMPROVED ! - Made with eneloop cell technology - these battery packs arrive to you PRE-CHARGED & READY TO USE ! Provides much more operating time than the standard battery. Re-charges with stock ICOM AD-58 charging cradle, or with our exclusive EMS-186 desktop Rapid-Smart Charger. These eneloop batteries will RETAIN THEIR CHARGE WHEN NOT IN USE, for reliable power when you need it !! Pricing is for 1 battery pack. Picture shows 2 views ofthe battery.